Welcome to Autumn – We’re so very fortunate to have the beauty of four seasons and maybe only a blizzard. Our hearts go out to all those who have lost so much caused by natural disasters. Our membership totals hover at about 400 Active Members. Each month I send out emails to those whose membership has expired. Thanks to all that renew! And each month, new members apply and we welcome and thank them!! Please read below our financial review from Tony Smolen, our CPA extraordinaire. And of course Bob Sez a lot about our upcoming events and TICKET GIVEAWAYS! Don Nelson has recapped our education programs to date, along with future endeavors. Bernie Walsh talks about our Annual Awards Show. 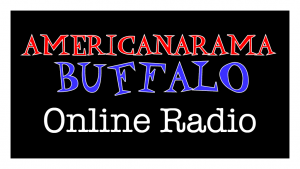 Our friend Elmer Ploetz talks about his online Radio Station, Americanarama Buffalo, and new this week is a calendar of events which include music events at all of our musical partner’s venues. We hope to see all of you at our annual SAMF Festival this coming Saturday, the 16th!! We coordinated over 63 volunteers to help make our Festival a success!! It is that time of year! We will be hosting the Third Annual Sportsmen’s Americana Music Foundation awards show. We have added a few little twists this year! We have asked the members to nominate their favorite bands to be put on the voting ballot. After nominations are determined we will send out the final voting ballot to members. The finalists will be announced by October 5th and the winners will be revealed on stage the night of the awards! The show will take place on Monday, October 16, 2017 at Sportsmen’s Tavern on Amherst Street. More Information about tickets and the show will be announced on our Facebook page. The Board of Sportsmen’s Americana Music Foundation thanks you for your support throughout the year. With the support of our members we are able to continue to keep Americana mustic alive in our community for future generations. The weekend of September 16th is fast approaching. 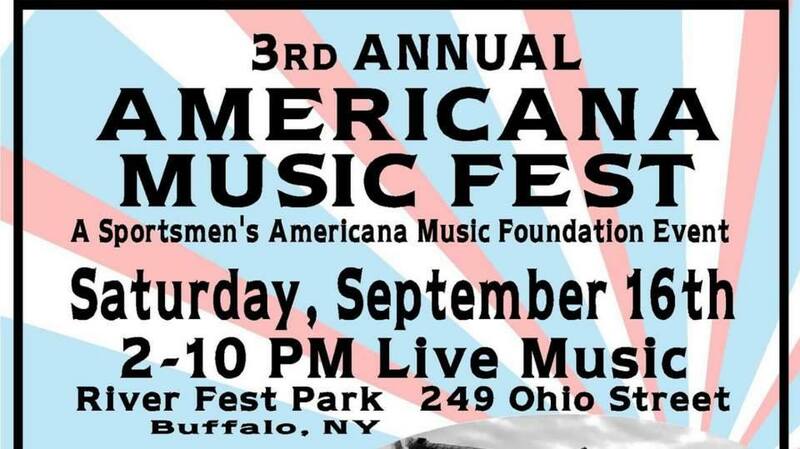 We’re having our 3rd Annual SAM Foundation Americana Music Festival at River Fest Park from 2-10 PM. It will be a great day of music, artists and fun for all. 7 bands for $7 bucks; there still time to get your ticket in advance. It will be $10 at the door. This Fest will continue the great success we had at Silo City in July. Ten Cent Howl and Leroy Townes will be returning to the stage for us, but the other five bands were not at Silo City so this will be a great opportunity to see all these extremely talented musicians in one place. The Rear View Ramblers, The Willies, The Skiffle Minstrels, The Kensingtons, and Uncle Ben’s Remedy will be closing the show. Matt Daggett is once again coordinating with local artists to have a variety of presentations at the Fest. Flying Bison and Labatt’s Blue will be there, along with Buffalo’s Best Grill food trucks. Our sponsors as of this writing include: Blue Cross Blue Shield, Labatt’s Brewery, Congressman Brian Higgins, Riverside Federal Credit Union, Ellicott Small Animal Hospital, The River Grille, Hastings/Cohn Real Estate, Life Storage and NY State Senator Tim Kennedy. Bring your family and friends for a great day in this beautiful park right near downtown Buffalo. There will be much more information coming next month but for now, mark your calendar on Friday, November 17th. 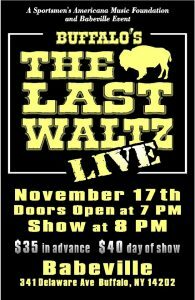 The Sportsmen’s Americana Music Foundation, in conjunction with Babeville is presenting “The Last Waltz” LIVE in Asbury Hall at Babeville, 341 Delaware Avenue. This will be a unique and unprecedented production of the beloved final concert by The Band, along with many special guests. Tickets are on sale now at The Sportsmen’s Tavern (cash or check to SAM Foundation) and The Babeville box office, $35 in advance, $40 day of show. Tickets can also be obtained at the Babeville website (extra fee required). Current members can email me by Friday, September 22nd and tell me which free tickets you’d like to win. Make sure to check out our new feature for The JAM, our monthly calendar (below). We’ll try to list as many events as we can each month. The musical talent in WNY, combined with touring artists, makes our hometown one of the most vibrant music scenes around. Our foundation is maturing as we are in our third year and are financially stable. All filing requirements are current which ensures our not-for-profit status moving forward. The SAM Foundation is continually achieving and expanding our goals concerning education – bringing the history of Americana Music to the community through lessons, events and our TV Show/Live Streaming. Please read below about our education initiatives, upcoming events, the progress we’ve made on our TV show and our collaborations with our musical partners. The SAM Foundation is proud of our member base. Our 400+ members don’t hesitate to support us by volunteering and coming to our musical events. Please renew your membership if it has lapsed. Any questions or concerns can be directed to Angela Hastings, samusicfoundation@gmail.com. MISSION: To get instruments into the hands and great music into the ears of as many kids as possible (especially in underserved communities)! ● Since our inception The Foundation, in collaboration with schools and community centers has designed and launched 10 multi-session workshops. ● Our Workshop Instructors are not only dedicated educators, but are accomplished and in many instances award winning artists such as Doug Yeomans, Katie Clark, Mark Panfil, Helen Butler, Alan Whitney, Tim Pitcher. ● PURCHASED Instruments – not only for our programs but to help to support other great programs like BSW (Buffalo String Works), for whom we purchased two cellos. ● PROGRAMS have included – beginner guitar lessons, music appreciation-learning songs, the history behind them as well as hands on introduction to the instruments used, guitar, banjo, mandolin, drums, spoons and rub boards. ● To date we’ve partnered with four different organizations – Valley Community Center, The International Preparatory School at Grover Cleveland, The Boys and Girls Club of Holland and The Old First Ward Community Center. presentation and sing-along for the kid at the Valley Community Center. ● THIS FALL- We expect to have at least three afterschool programs running concurrently, kicking off shortly after the start of the new year. ● OUR GOAL for 2018 – PARTNER with TWO additional schools/community centers and we expect to double the number of young Western New Yorkers participating in our programs. 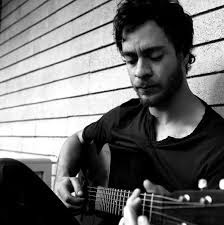 ● Beginner and intermediate guitar 10 week workshops. We Sponsored two this year and are planning multi-session workshop on blues guitar this fall. All headed by Buffalo Hall of Fame Artists. ● SCHOLARSHIPS Funded Scholarship awarded by the Buffalo Jazz Collective earlier this year and will be awarding our own scholarship later this year. What’s new with the Americanarama Buffalo online station? Well, we’re glad you asked. Here’s a list of some of the artists/albums that we added to our playlist over the summer. We have over 1,300 songs in the rotation now (well, it’s 1,316 as I type this, but who’s keeping track?). So … do you have music you’d like to submit for possible play on Americanarama Buffalo? Also, do you have some live sets you’d be willing to share for play on the station? Contact Elmer Ploetz at http://ploetz@fredonia.edu for info. Or just search for the radioking app for your phone. If you are an Active member and do not have a SAMF membership card, please email me at samusicfoundation@gmail.com. If you are unsure if you’re an Active member, please don’t hesitate to ask. Watch batteries installed for $5 instead of $7. 25% off the regular price of anything in stock. MusicalFare Theater – $5 off General Admission online.